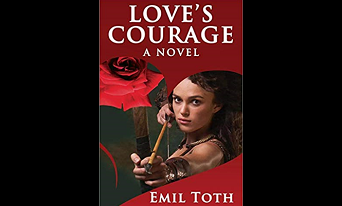 Emil Toth will be signing copies of the latest book, Love’s Courage, in the bookstore on Sunday, April 14. Please stop in and congratulate him. The novel brings to light the many ways courage guides people’s lives. It tells how Kaathi, the enlightened healer, visits a nearby village and forms a hunger protest to acquire women’s equal rights. It tells of Ashlee’s abduction at the age of nine and the terror she lives through as a slave to a mutant family. She escapes and is close to death when she is saved by Kaathi. Sharika, a woman warrior, detects inbreeding has affected her people and leaves her village. Sharika falls in love and fears telling her lover she may be carrying inbred genes. Kaathi continues to help people seek Beloved.